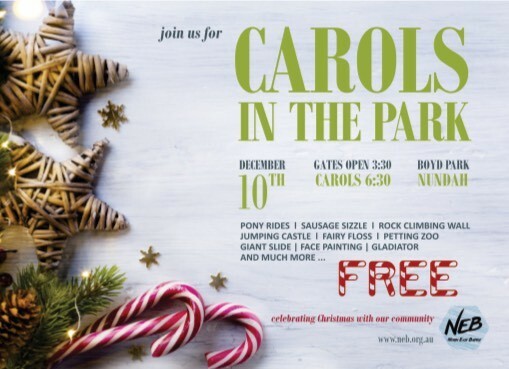 Boyd Park, Nundah will be filled with locals enjoying Christmas cheer on Sunday 10 December. Starting at 3:30pm there will be a free community festival followed by community Christmas carols. At the community festival, there will be free activities including a rock climbing wall, jumping castle, pony rides and gladiator competition. Children can decorate a plaster mould or get their face pained, all for free. North East Baptist volunteers will be hosting a free sausage sizzle and there will be the opportunity to purchase drinks. The community Christmas carols will start at 6:30pm and with the North East Baptist Choir singing a range of traditional and modern songs. For further information contact Angela at the North East Baptist office on tel: 07 3266 5266 or email: admin@neb.org.au.